All the music, all the time. Most of us now own a Bluetooth speaker of some sort, to get the tunes from our mobile devices to our ears with far higher quality than a phone’s tiny speaker can handle. But what if you run out of tunes, or fancy hearing the news? Sure you can pop on the radio, but that means digging out yet another device. And also, what if you want to listen to something on your computer that doesn’t support Bluetooth? You’ll have to plug YET ANOTHER set of speakers in for that. 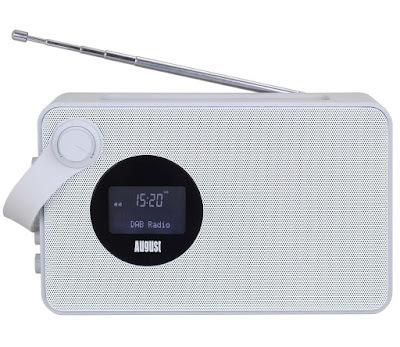 Or… you could just buy the August International Bluetooth Speaker with DAB Radio. To give it it’s full name, the August International Bluetooth Speaker with DAB/DAB+/FM Radio MB415W is packed with features. First and foremost, this is a Bluetooth speaker, capable of connecting to any Bluetooth-enabled device using Near Field Communication (NFC). The range of use is the standard 10 (or so) metres, and connecting was achieved with a simple tap of a phone or tablet. Second of all is the fact that this is also a digital radio, picking up DAB, DAB+, and good ol’ FM broadcasts. The front side features a circular LCD display which helps in finding the right frequency, as well as displaying the mode that the unit is currently in. It finds stations fast and we found the reception was great, even with the telescopic antenna only slightly deployed. But it doesn’t stop there. If you have neither Bluetooth not a desire to listen to the wireless, you can always connect a device with the 3.5mm auxiliary port using the included wire. This means the August International Bluetooth Speaker with DAB Radio can also be used as a desktop speaker for older PCs while still having all the other more modern features accessible. But wait, there’s more? Yep. It also boasts an SD card port on the back, allowing you to insert a card packed with music to play. All you have to do is turn the knob (tee hee) to the SD function, and the speaker will automatically recognise any MP3 files on the card, then simply use the top buttons to scroll through the list and select the track you want. Cool. So that’s all, right? No, unbelievably there’s more. The August International Bluetooth Speaker with DAB Radio is also an alarm clock which can be set to go off playing your favourite station. Oh, and as well as being powered by a Micro USB power adaptor, it also includes a rechargeable battery capable of keeping you wire-free for more than three hours. The 5W speaker performs very well, both when used for pumping music and when streaming quiet discussion. The real USP here is that the August International Bluetooth Speaker with DAB Radio ticks a lot of audio requirements with just one product, as well as waking you up in the morning. It looks great, it works great, and ain’t nobody gonna complain about the price. Nice one, guys.